Over the course of the last two years I have received grants from three different foundations that should allow me to return to Japan and participate in my fifth apprenticeship: this time with one of the last boat builders of Okinawa. This chain of islands was, for most of its history, a distinct kingdom and to this day enjoys a reputation for a very unique culture with important differences with mainland Japan. In boat building, the traditional fishing boat is called the sabani, and these boats descended relatively recently from dugout canoes. In the west we would call them semi dugouts, with partially carved bottoms to which planking is added. One of many elements that interest me is the method of fastening the planking. 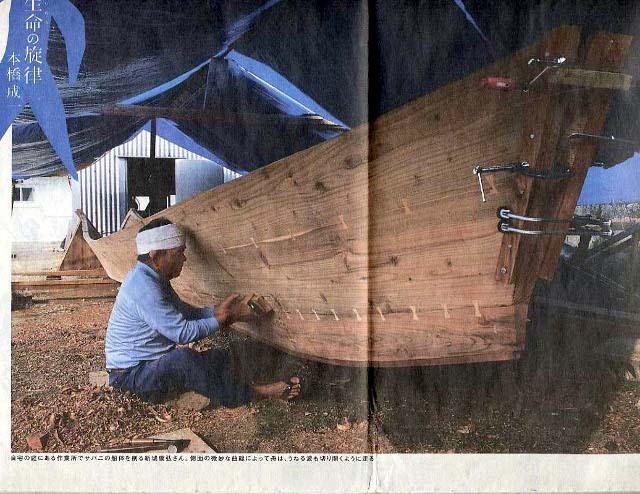 Okinawan boat builders use wooden butterfly keys to edge fasten the planking. These keys are inserted half the depth of the plank, spanning the seam, and alternate from both the inside and outside of the hull. I had seen this technique used by a boat builder making semi dugouts in Ishikawa Prefecture on the Sea of Japan, and I have also met a boat builder on the Agano River in Niigata Prefecture that used this method. I was very eager to study with the latter craftsman and learn how to use these fastenings, but he became too ill to work. Now, years later, I hope to get my chance, and also learn what must be many other differences between Okinawan and Japanese boats. As of this writing, the hope is that I will go to Okinawa mid-November, 2009 and begin building an eight meter sabani with one of perhaps just three surviving traditional boat builders. Note the butterfly keys in the planking. I am pleased to announce that I have been awarded a publishing grant from the United States -- Japan Foundation of New York. These funds will support me while I write a book manuscript detailing what I have learned over the course of four apprenticeships with Japanese boat builders in 1996, 2000, 2002 and 2003. I will be working with Floating World Editions and we hope to have this book finished for publication in 2010. Keep posted here for updates and if you would like to receive an email announcing the publication and how you can get a copy, please contact me via the email link on this site's homepage. The Rushton catboat that I built for a client has finally gone sailing! No need to say too much about it here, as there is a page dedicated to this project at the Customs Boat page of this website. When she comes out of the water this summer the owner has asked me for two changes: a larger, deeper rudder and nine foot oars instead of the eight foot oars I supplied with the boat. Visitors to this website wouldn't know it, but in addition to building boats and writing about boats, I also building traditional Japanese furniture and interiors. The term tansu encompasses a wide variety of Japanese storage furniture, and I have also built shoji screens and even a wooden bathtub. I was asked to build this piece for an exhbit that opened at the Bard Graduate Center in New York City. The piece is a replica of a Meiji era (1868-1912) Japanese chest designed for storing tea and the implements used in tea ceremony. The wood is southern cypress (similar to Japanese hinoki) and the hardware is from Japan. The case joinery is called hanken shiki, or what in the West is called finger joinery. The use of a five-part joint at the corners is called go mai gumi tsugi. These joints are further reinforced in the traditional manner with bamboo nails. The sliding doors run in wooden tracks like shoji screens, and behind the large doors are asymmetrical shelves known as chigai dana. The hinged door swings on brass knife hinges and latches with a bullet catch, which are not traditional. 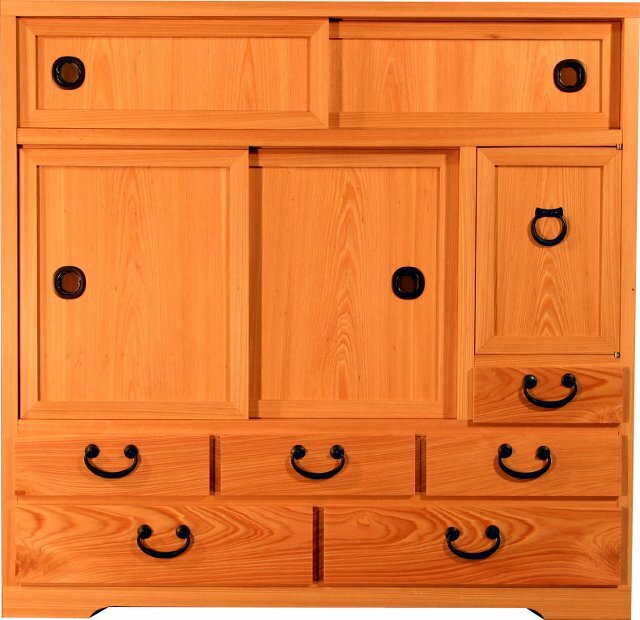 The simplicity and asymmetry of this cabinet are typical of Japanese tansu. It could be argued that these two values, which are so prevalent in Japanese furniture, exemplify the twin influences of Shintoism and Buddhism on Japanese arts, aesthetics and culture. The randomness of the design reflects the Shinto obsession with nature and its lack of order. The lack of balance and symmetry creates a question, inviting the viewer to engage with the piece at a deeper level. In the Buddhist view, the beauty of the piece lies in the viewers' process of imagination, reflection and discovery.